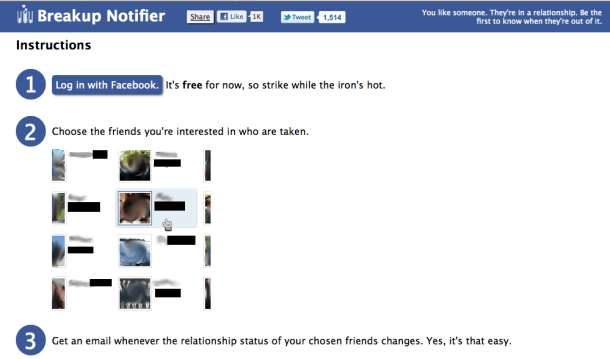 You know when you’re single and you have a list of people of people that you sort of fancy and you kind of keep a list of them in your head and occasionally check their Facebook profile just to see if they’ve broken up with that girlfriend/boyfriend and potentially would be interested in making love to you? Well, there’s now an app to help you in your noble work. The Facebook Break-Up notifier sends you a message when anyone on your stalker list changes their relationship status to “single”. Developer Dan Loewenherz has made the Breakup Notifier App and it could give you some vital extra time to know immediately when your crush is back on the market. So to speak. 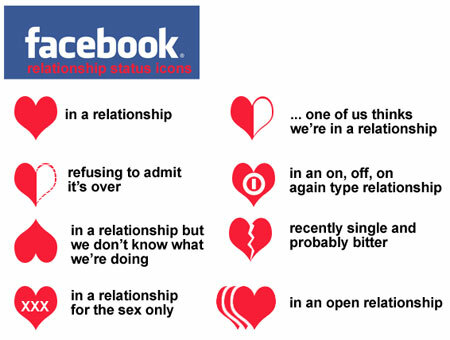 Of course the problem with this is that not everybody declares their relationship status on their Facebook profiles. Some people just leave it blank, others say they are married to their cat or are in a complicated relationship with themselves. Not very helpful. However when the information is there, this app is the one you want to help you find it. Be informed. BTW: we like these made-up facebook notifications below.